With the adoption of a greyhound, we happily become responsible for every aspect of the dog’s care. Regular trimming of your dog’s toenails, including the dewclaws (if present), is a vital part of dog care. LONG: Nails that touch the floor are too long. To examine the length of your greyhound’s nails, stand your dog on a hard, flat surface and view from the side. There should be some clearance between the nails and the floor. 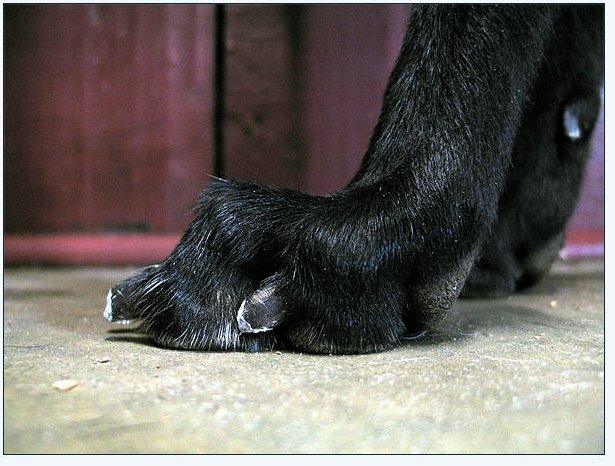 DANGEROUS: Professional greyhound trainers know that a dog is only as good as its feet, and the fastest way to ruin feet is to let them end in long toenails. UNCOMFORTABLE: When the toenails are hitting the floor, the bones of the foot spread causing discomfort and eventually splayed feet and lameness. 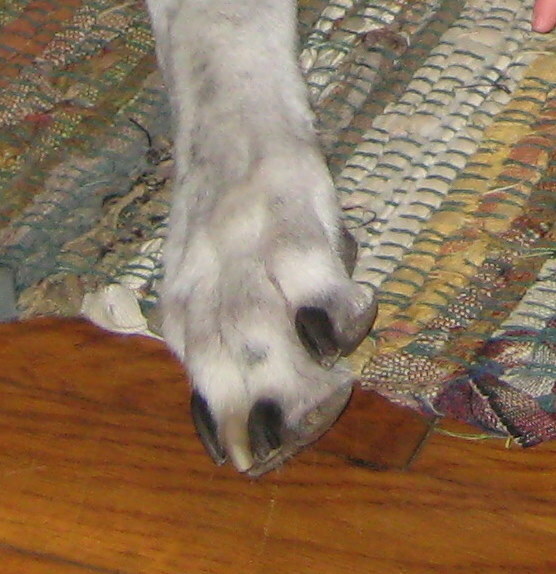 Extremely long nails force the dog to stand with its weight on its heels, causing a hook shape to the front legs and distorting the configuration of the muscles in the legs, shoulders and back. Your goal is to keep your dog’s nails from touching the floor. Trim toenails every five to seven days in order to keep them from growing longer. Bi-weekly or monthly trimmings aren’t frequent enough to stay ahead of toenail growth. By clipping every five to seven days, you take one step back and nature takes one step forward with nail growth. Clipping too infrequently allows nature to take a huge unchecked leap forward. It’s impossible to stay ahead or even catch up in the latter scenario. The biggest reason for neglecting nails is the fear of cutting the quick, the blood vessel and nerve ending that grows partially down the shaft of the nail. If you cut too much nail, you will hit the quick, causing some discomfort and bleeding. Repeat after me: everyone hits a quick now and then. Do not use this as a reason not to cut nails. Instead, prepare for the possibility by having styptic powder (a clotting agent), or alternatives such as flour, cornstarch, a wet tea bag or a bar of soap on stand-by. There are two types of clippers available. The first style operates like scissors with both blades moving across the nail. The other type of clipper is the guillotine style with a single blade that moves across the nail. I do not recommend this type because the spring can jam in the middle of a clipping, there is no safety guard that prevents you from putting too much nail into the clipper, and if used improperly, you are putting significantly more nail into the clipper than it appears. Remember to replace or sharpen your clippers when they become dull. Dremeled nails can be cut much shorter because the action seems to push the quicks back far more than nail clippers do. A growing number of people are using nail grinders (also referred to as a “Dremel”) in conjunction with standard clippers. Grinders are a power tool that have a cylindrical sand paper attachment. The sand paper head grinds off length and smoothes down rough edges. Grinders are available in various speeds—15,000-20,000 rpm is ideal. Either speed is effective. Racing greyhounds are accustomed to having their nails clipped and will usually stand co-operatively. If necessary, someone may hold onto your dog’s collar while you clip. Give lots of praise, reassurance and treats while clipping and make it a fun, positive experience. Handle your dog’s feet daily to keep it used to the sensation. Although walking on pavement helps, it isn’t sufficient to keep nails short. If you are unsure about how to clip, take your dog to a groomer or vet and have him/her show you how it’s done. The investment is minimal and the knowledge and confidence you gain is priceless. Regular nail clipping has its rewards. Minimal time and effort are required in trimming if you keep up with nail growth and are only cutting back what has grown. Finally, if your dog’s nails are too long, seize any opportunity to have your dog’s nails clipped back when it goes under anesthesia. Reference:Caroline Coile, 1996. Greyhounds. Barron. Cheryl, thanks for mentioning subscribing to the website. I just realized that feature hadn’t been enabled! Please see the subscribe feature in the upper right corner of the Home Page. I hope it’s active now. I would like to subscribe! Thank you! In 1996–it was dangerous to cut a dog’s nails. Now there are products you can use to make the job much easier and safer for the poor darlings.